Cothrom, meaning opportunity in Gaelic, is a Community and Development organisation in South Uist in the Outer Hebrides. Training is the main focus of our work but the organisation also includes a full time Gaelic Nursery and a furniture restoration and recycling enterprise. There are no jobs with Cothrom Ltd at the moment. Sign up to email alerts below to get notified when new jobs are added. 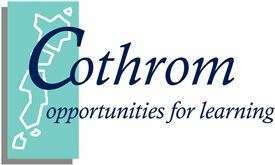 Get the latest jobs from Cothrom Ltd sent direct to your inbox!